All material recorded and produced in Mannheim. Released in a 4-panel Digipak. Includes a 4-page insert. The catalog number appears as "TESCO 100" on the spine and as "100" on the rear cover in the label logo. The pressing credit is identified by the matrix. 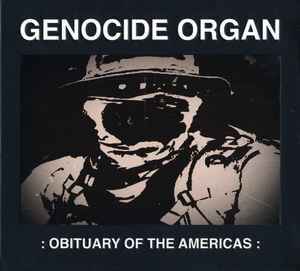 Genocide Organ have hidden in the jungles, hills, deserts, slums and cities of the Americas for 4 years. Being present on the shores of Panama, in the cardboard areas of El Salvador, the jungles of Guatemala, the drug routes of Bolivia, the human-drug trafficking in Mexico, the just in-justice in no-go areas just across the iron border of the US. Meeting paramilitares, Kommunist guerillas, dining in Fort Benning and getting their final degrees at the School of the Americas. Trekking regions highly praised for ancient cultures, for individual tourism, the beauty of the landscape and the peaceful inhabitants - but some of these areas turned into nightmares far beyond imagination, they are out of focus of what is happening in places that seem to be of more interest to the european stock market. In fact everything is connected. If you are worthless in a region, you are worthless in all regions. :Obituary of the Americas: is a slow creeping, noise-layered journey through some dark hearts. Dark noisy beats are the rhythms for the decay and resistance of those involved, examined out of multiple angles and perspectives - the campesino, the elite soldier, the self-defense man, the drug-lord or the common criminal, with harsh aggressive outbreaks of noise driven electronic assaults - the list could be endless and it is! Today is the same as yesterday, it is world without a tomorrow!